By now, if you haven’t heard his name, seen him on Hawg Quest, listened to his interviews on “The Outdoor Line” or read about his derby-dominating exploits in the paper, you’re probably still in “media blackout” from the election…While no one can blame you for dodging the noise, I can assure you that it’s now safe to come out, unless you’re a salmon in the vicinity of Derek Floyd. 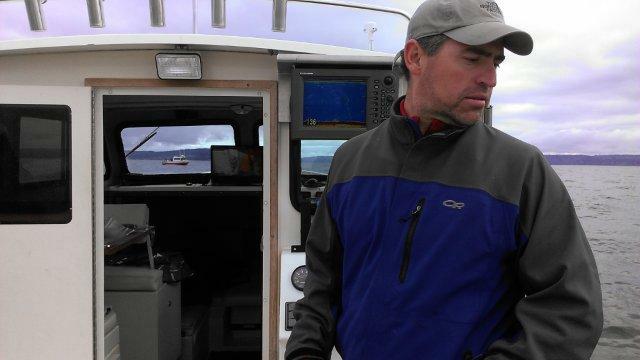 Derek has been quietly and efficiently perfecting his trade over the last two decades in southeast Alaska, specifically Sitka Sound, long recognized as a salt water salmon stronghold. The Floyd family runs Reel Class Charters which is truly a top-notch operation in a world-class location. 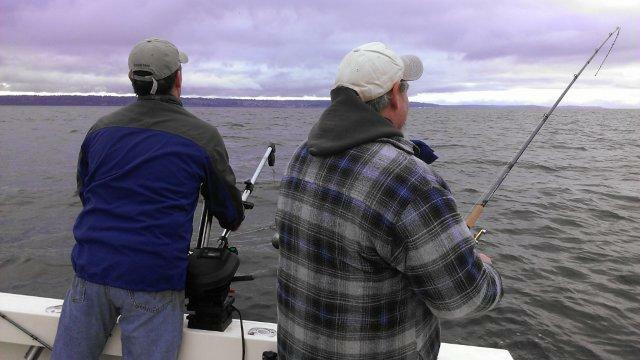 Now, Derek is bringing his expertise in guiding salmon anglers to the Puget Sound in the form of Angler’s Choice Charters. So, when my long-time friend offered a look at his new Washington charter vessel, a roomy 23′ Parker…I bet you can guess what my answer was! 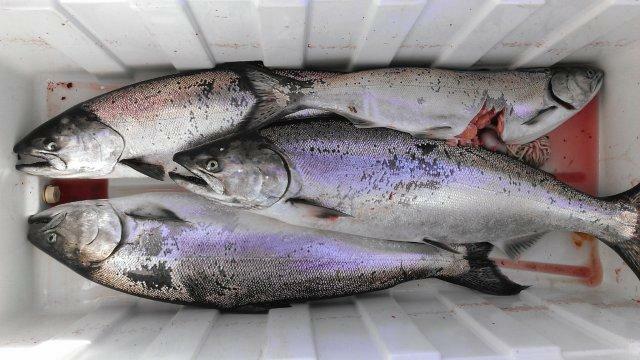 Ever since the north Puget Sound (aka Marine Area 9) opened for winter chinook or “blackmouth” season on November 1st, only the weather has held anglers back from filling their fish boxes! 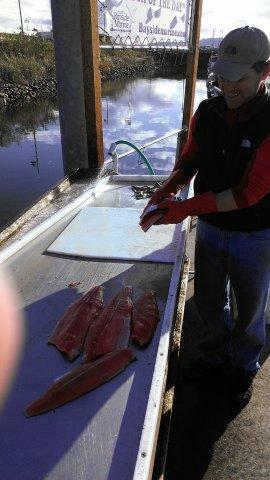 The center of all this salmonid madness is Possession Bar, at the southern tip of Whidbey Island. While the summer selective chinook season was certainly one for the books, Possession Bar was definitely NOT one of the hot spots. 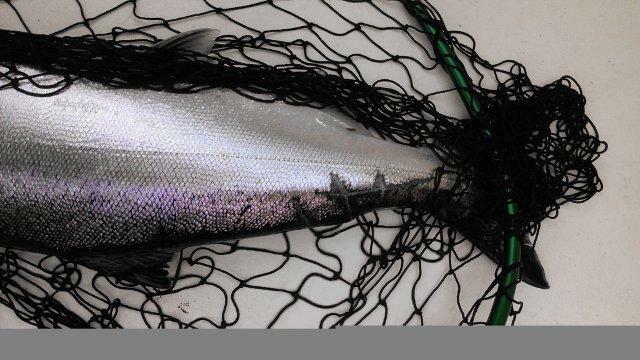 Despite holding huge schools of herring for the majority of the summer, migrating adult chinook only showed up sporadically, leaving a large biomass of bait for the feeding winter chinook. Needless to say, the November first opener went off with a “bang”! So, how did we fare on our recent outing? Read on bretheren! Derek Floyd in his native habitat, the stern steering station of his charter boat in close proximity to some high-quality marine electronics. Here’s a screen shot (pardon the blur, we were running at the time) of the program Derek Floyd uses as a hyper-accurate chartplotter. It’s called “Catch” by Nobeltec and it’s ungodly expensive. This is a shot of the canyon just south of the Everett Harbor. 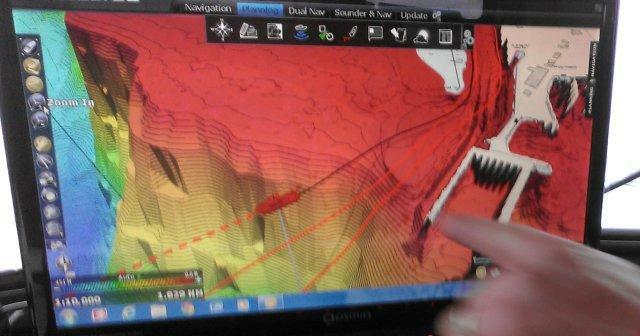 Lowrance Electronics has a less exotic but similar 3D function built into the HDS series. Lowrance Insight Genesis actually allows you to increase the accuracy of your chartplotter by recording your own sounder’s echoes. We reached our destination on the west side of Possession Bar and wasted little time deploying Derek’s gear of choice. Hot Spot flashers 48″ in front of 3″ Silver Horde Kingfisher spoons. Finned 15 pound downrigger balls sporting Cannon’s Offshore Releases on 4-foot drops provided the depth control and we targeted depths from 100-140 feet. Schools of herring lit up the sounder as soon as we arrived and we were quickly into fish! Joining us on our outing to Possession Bar was none other than the Reverend Captain Jay Field. Here, Derek clears the riggers as Jay expertly works the rod. Our next clue that we were in the proximity of prowling pinnipeds? Check out the bite radius on the blackmouth in the upper right! We had to spin the reel handles fast to win that battle! 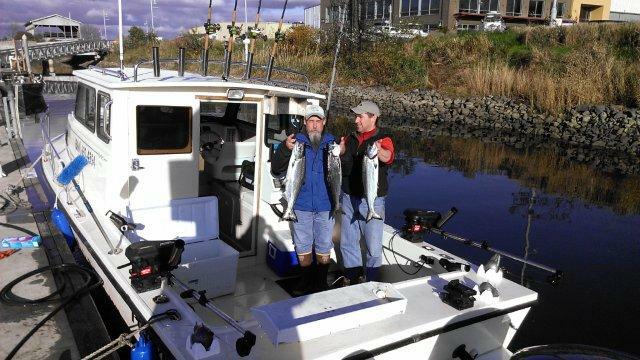 All in all, it was a great day in the rare November sunshine with a couple great guys and the fish actually cooperated! 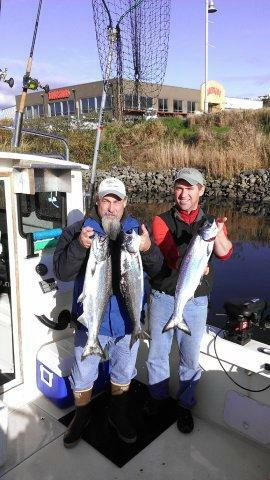 If you’re looking to hone your salmon savvy, my recommendation would be to book a trip with Derek Floyd. Hopefully, you’ll find yourself taking this very same picture of Derek expertly trimming your filets and joking about a great day on the water!